Ensure compliance with changing federal and state regulations. Consistently closed monthly financials within 4 days of the end of the month. Met or exceeded national average on major quality measures. By eliminating paper-based processes, agencies also increase clinical and billing productivity, which means clinicians close their visits faster, and bills get out the door sooner. Complete documentation and cube reports help agencies resolve compliance issues before they become the interest of auditors. Touro At Home is the home care agency of Touro Infirmary, the only community-based, not-for-profit, faith-based hospital in New Orleans, Louisiana. The agency provides intermittent care to patients in their homes under the direction of the patients’ physicians. Touro At Home offers many services, including skilled nursing, physical therapy, occupational therapy, speech/language pathology, and nutritional counseling. The Medicare-certified agency meets the home care standards of the Joint Commission. Touro At Home is not the only home care agency to welcome auditors into its offices. At four surveys (two Joint Commission and two state surveys) in the past three years, however, the hospital-based, Medicare-certified home care agency has certainly weathered its fair share of audits. And not only has the organization survived the audits, but it also has walked away free of deficiencies. 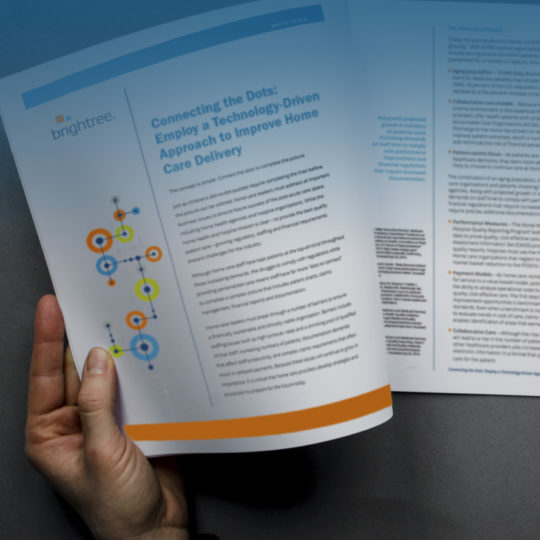 As a Brightree customer, Touro credits the home health software with attracting and retaining great talent, improving productivity, and keeping the agency in compliance. Touro knows that good people are behind every good company, and it uses the Brightree solution to attract great talent. “Brightree has helped with our recruiting because our employees don’t have to come to the office to drop off notes all of the time, which makes life easier for them while saving us money. I think that’s a big plus for our employees,” says Cindy Dauner, Touro’s director and a former Joint Commission surveyor. With staff using four different systems to collect patient information, it typically required two weeks to process orders and evaluations and two to three additional weeks to upload ongoing services to patient files. To store the spreadsheets and documents created in the field, Solace used an on-line cloud solution for file storage. Touro also uses Brightree to retain great talent. The agency names communication as a major benefit; clinicians in the field can easily access patient information documented by other clinicians. So, not only are Touro employees free of the hassle of delivering paper charts to the home office, which gives them more time to visit patients, but they also have the tools and information needed to provide the best care. “Information is power. The more information we can get, the better off we are, and Brightree gives us easy access to the information we need to provide quality care for our patients,” adds Dauner. Touro chose the point-of-care functionality and cloud-based delivery of Brightree Home Health software. Imagine what an agency could do with an extra $45,000 a year. Touro says it saves at least this much annually by using Brightree home health software to eliminate paper-based processes and improve productivity. Although each Touro clinician sees five to six patients per day, he or she is able to consistently close visit notes within 24 hours because documentation is completed in the home. And the time savings don’t just extend to clinicians in the field. “The technology allows us to close our billing records in the first four business days of the month which is what the hospital [Touro Infirmary] wants us to do,” says Dauner. Everyone’s happy: Touro doesn’t scramble at the beginning of the month to pull figures from paper charts, and the hospital gets the data it needs about the home care agency’s revenue and monthly visits in record time. When the Touro team talks about the success it has achieved with Brightree, compliance is a frequent theme. “Our hospital holds our feet to the fire in terms of compliance. It makes sure that our i’s are dotted and our t’s are crossed. It’s been my experience over the years, and I’ve been doing home health since 1984, that when you have one little area of non-compliance, it’s like a thread that you pull, and everything else unravels. Brightree helps us identify and stop problems before they start,” notes Dauner. So how is Dauner using Brightree to overcome compliance challenges? For one, she notes that documentation is legible, and reports help preemptively identify compliance issues that state auditors have set in their sights. The Home Health Compare data speaks for itself: Touro outperforms competitors by meeting or exceeding national averages on key quality measures, including how often patients were admitted to the hospital, how often the team checked for and treated pain, how often patients’ wounds improved, how often the team checked patients for risks of developing pressure sores and included treatments to prevent sores, and how often patients were checked for signs of depression.